As a full-time working mom and a blogger with a techie husband and internet and entertainment-savvy kids, a reliable internet connection is a must in our home. We’ve been a PLDT Home subscriber for years already and truly it has helped us in our business transactions, work requirements, children’s school research, and simply in enjoying our bonding time at home as a family by watching videos uploaded online or live streaming of some shows. As if their service to our family isn’t enough, PLDT Home breaks new ground yet again as it brings to the Philippines another game-changing innovation on the TVolution Stick in partnership with global technology giant Microsoft. 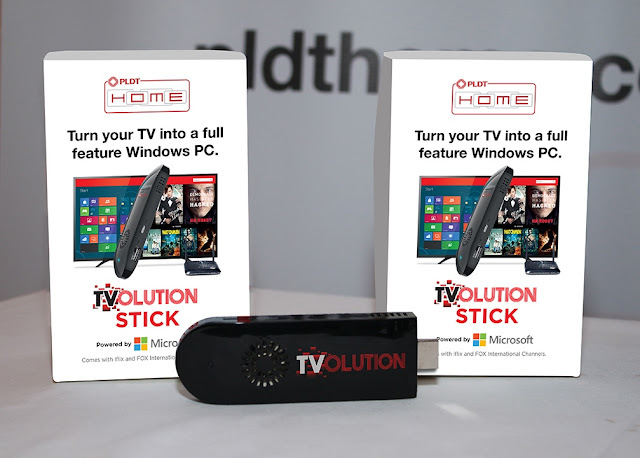 The TVolution Stick by Microsoft is the next level in PLDT HOME’s pioneering portfolio of over-the-top (OTT) devices which started with the TVolution—the Philippines’ first OTT device which turns an ordinary TV into an Internet TV. 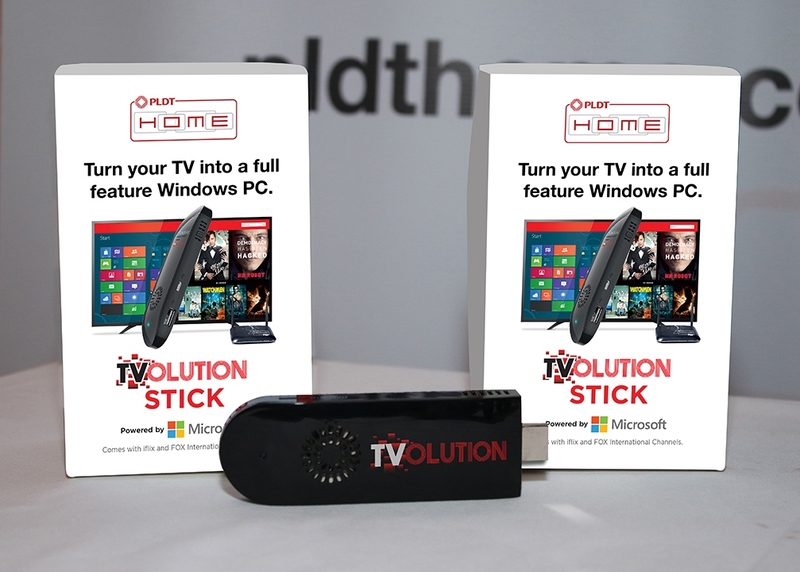 Following the success of TVolution, PLDT HOME raised the bar with the recent launch of TVolution Stick—a dongle-sized device which transforms any HDMI-ready TV into a fully functional PC. It is based on the Intel Compute Stick and runs on Windows OS 8.1, letting users stream movies and videos, search the web, send and receive emails and do other activities that are normally done on a PC. It’s unlike Chromecast which primarily functions as a casting & streaming device. Wow! Now the good just got really better. I cannot believe that we could use our HDMI-ready TV into a fully functional PC with just a dongle-sized device! This just means more bonding time for the family as we will no longer stick our heads together to view live streaming of shows on our laptop’s small screen. Now we could all comfortably watch shows while lounging on the bed. This also means, it would be more visually easier for me to teach my kids about their lessons in school using the TV when we research on a topic I need to elaborate or guide them through. This also means, an extra (and huge) gadget I could use when I need to browse through the internet to read other blogs, check emails or research on anything, when the other laptop is in use by either my hubby or the kids. It is packed with Office 365 (Word, Excel, Powerpoint, One Note, OneDrive, also Skype), making my working life easier on days when I have to do a little work at home like replying to emails or simple document editing. I used to bring home my bulky and heavy work laptop, but with PLDT Home TVolution Stick, I don’t have to burden myself with this literally “heavy” load! The TVolution Stick by Microsoft is portable, plug-and-play simple and productive. The TVolution Stick by Microsoft is available to new PLDT HOME subscribers or existing subscribers who upgrade to high-speed plans 999 and up. All new PLDT HOME Fibr and DSL Plan 999 subscribers also get the stick for free, complete with iflix and Fox, until December 31, 2015. Visit pldthome.com for more details.